A whistleblower is a person who tells the federal or state government or a certain governmental authority (such as the United States Securities and Exchanges Commission) about illegal, fraudulent, or dishonest conduct of a person or an organization. 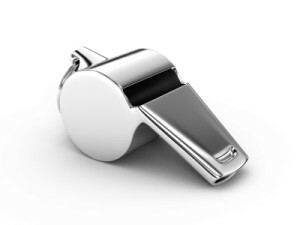 In essence, a whistleblower is bringing a lawsuit on behalf of the government by “blowing the whistle” against a person or an organization for cheating the government.If you are seeking whistleblower protection, or you have information that requires a whistleblower attorney (also known as Qui Tam Action), the lawyers at KHF provide experience and high quality legal services. The False Claims Act is the primary federal law that prohibits a person or an organization from making a false claim for recovery from the government. The False Claims Act also provides a mechanism for a whistleblower to bring a lawsuit on behalf of the government if fraud is discovered. When a whistleblower, the original source of information revealing government fraud, reports the fraud to the government, the whistleblower will also be entitled to a percentage of the recovery as a reward for exposing the wrongdoer and recovering funds for the government. Contractor Fraud: A contractor could be liable based on the way in which its contract was obtained. This includes using kickbacks or bribes to win the contract, or submitting a false certification of regulatory or statutory compliance along with a payment invoice to the government. Healthcare Fraud: Any person or organization violating laws and regulations governing Medicare or Medicaid programs could be liable under the False Claims Act. Potential healthcare fraud can involve a company (usually pharmaceutical company) providing kickbacks or bribes to a medical provider to induce the medical provider to use or promote the company’s drugs or services. General Services of Administration (or GSA) Contract Fraud: Anyone who provides services or products to the government (vendors or contractors) must provide services or products at its “best pricing” under the GSA contract. If the person provides its services or products to the government at a price higher than the price it charges its other customers, it could be liable under the False Claims Act. Defense Contractor Fraud: Common defense contractor fraud includes billing for services or products that were not provided, providing services or products that fall below the required standard, or providing defective services or products. For more information relating to whistleblower actions, please contact our affiliate Qui Tam Team. The lawyers at KHF are committed to holding those who defraud the government responsible for their actions. If you believe you have information relating to a person or an organization cheating the government, please contact us.